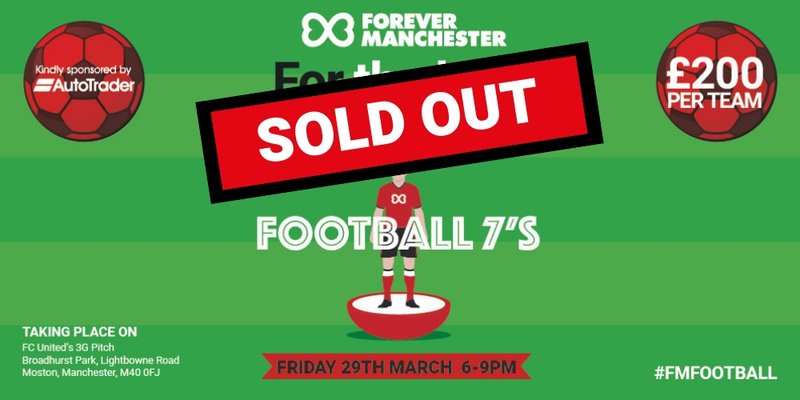 The annual Forever Manchester Football 7s Tournament, kindly sponsored by Auto Trader, will take place on Friday 29th March 2019 on the 3G Community Pitch at FC United of Manchester’s, Broadhurst Park in Moston, North Manchester. The 7-a-side charity football tournament will see 15 teams competing against each other in the format of three leagues of five teams, followed by semi-finals and final. The tournament is open for male, female and mixed teams (minimum age of 16). Each team must have a squad of a minimum of seven players. 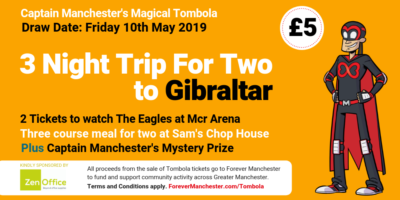 As well as helping to raise money for local community projects, the tournament provides businesses with the opportunity for staff to come together as a team as well as meeting, and networking, with other local businesses. This year’s tournament has raised £3,500 for Forever Manchester. The bar at FC United will be open from 8pm till 9:30pm for post match drinks. The draw for the group stages of the Forever Manchester Football 7’s Tournament was made on Thursday 21st February. The full-sized floodlit 3G pitch will be divided into three pitches playing across the width of the pitch. Each match will last 10 minutes and every team will be guaranteed to play a minimum of four matches. Matches will begin at 6pm, so players are encouraged to get to the ground in good time (from 5pm). There is free car parking available, as well as access to the changing and shower facilities. We recommend that players in a team all wear the same coloured shirts. Coloured bibs will be provided if there is a clash of colours. Football boots and astroturf trainers are allowed, however metal studs/blades are forbidden. We recommend that all players should wear shin pads. All matches will be refereed by a qualified referee. Three points will be awarded for a win and one point for a draw. On each pitch the Group’s Fixtures and Results from each match will be recorded and displayed. The team with the most points in each league will progress through to the Semi-Finals. If points are tied at the top then it will go down to the best head-to-head result. If this is inconclusive then goal difference will decide, if that is the same then it is most goals scored. If this is still inconclusive, a penalty shoot-out (5 pens each) will take place between the two teams. The team who finishes the best runner-up in terms of points will also progress to the Semi-Final. Likewise if the runners-up have equal points, then goal difference then goals scored will determine the best runner-up. 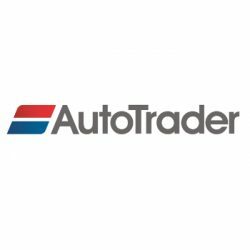 We would like to say a huge thank you to Auto Trader for kindly sponsoring the Football 7s Tournament, helping to cover the costs of tournament ensuring that all money received from the teams taking part goes to support community activity across Greater Manchester. Not only is Auto Trader sponsoring the tournament they are also entering 2 teams. With headquarters in central Manchester, Auto Trader Group plc is the UK and Ireland’s largest digital automotive marketplace. Auto Trader sits at the heart of the UK’s vehicle buying process and its primary activity is to help vehicle retailers compete effectively on the marketplace in order to sell more vehicles, faster.